The set consists of five eye shields all in good condition. This is a field-green painted steel construction metal box buckle. The buckle is not maker marked. 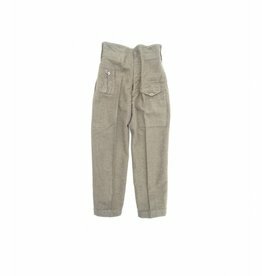 The trousers are in good worn condition, shows traces of usage. Has been shortened and the belt loops are sewn instead of using buttons. 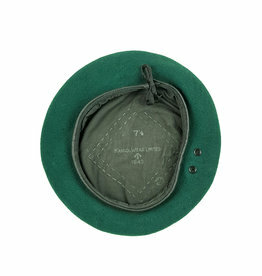 The beret is maker marked 'Kangol Wear Limited' and dated 1944 with size 6 7/8. 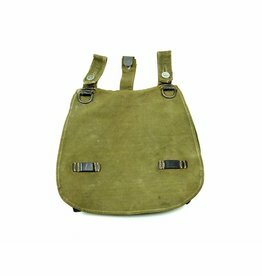 Manufactured late 1943 till 1945. The smock is showing traces of usage, one lower press stud is missing and one button on the left sleeve. This is a collar for the collarless-shirts. The collar is marked 14 1/2 inch, which equates to a size 4. 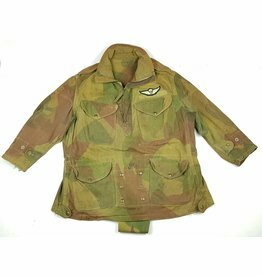 The beret is dated 1945. With its original capbadge and its tartan of the Highland Light Infantry. The ball is present. Shows normal traces of usage. This is a mid-war production. Complete with all buttons and straps.